The Good To-Go Products arrived in two different flavors. I received the Smoked Three Bean Chili and the Classic Marinara With Penne. Each was in a pouch that could be used to both rehydrate the product and serve. My first impression was that the products had significant calories for a single serving (a positive). According to information received with the products, the company was founded by an accomplished chef and her husband. The emphasis on their products was to prepare foods "just like you would make at home or enjoy at your favorite restaurant". Reportedly only real vegetables sourced from North America, freshly ground spices, extra virgin olive oil and stocks made from fresh ingredients are used in their products. The meals are cooked and then dehydrated rather than freeze dried. They are available in either one or two-serving sizes. The single serving size on the products I received was a hearty 460 calories for the marinara entree and 340 for the chili entree. This is a great amount of calories for the net weight of each product (3.5 oz/100 grams). 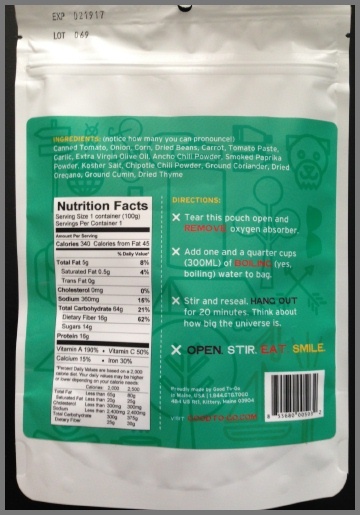 To serve, I will add a set amount of boiling water (varies with product) and then re-seal the bag. Twenty minutes later it should be ready to eat! I also noted that the products had very little fat, sugar and sodium in them, making for better nutrition in my opinion. There are no additives or preservatives and they are cholesterol free. They are also gluten free and vegetarian for those inclined. The Smoked Three Bean Chili is a "traditional chili with corn and caramelized onions" according to the packaging. A good variety of spices are added to the main contents which are tomato based as well as beans, carrots, garlic, onion, corn and olive oil (not in order). The Classic Marinara with Penne is an Italian tomato sauce with brown rice penne entree (gluten free). The ingredients include the penne as well as tomato products, onion, extra virgin olive oil, garlic, nutritional yeast, agave nectar and a host of spices. Each product has about a two-year shelf life with the expiration date clearly marked on the back of the packaging. I can't wait to get out in the field to try the products. I am always looking to improve nutrition and taste in my outdoor meals. It will be interesting to see if they pack the right ingredients to keep me satisfied. During the testing period I have spent ten nights in the backcountry. 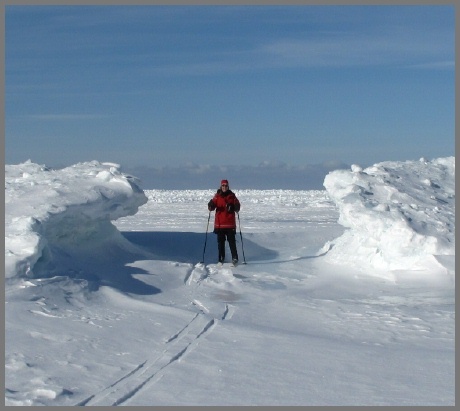 Locations of all trips were in the State of Michigan and ranged from lakeshore to boreal forest. Elevation ranged from above 600 ft (183 m) to 2,000 ft (610 m). Soon after I posted my Initial Report I received three more packages of meals. The chili entree was identical to the one noted above. 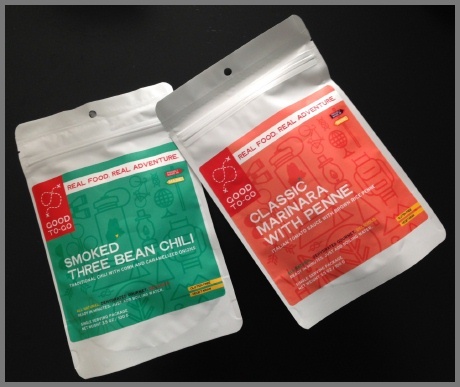 The two new flavors were Thai Curry and Herbed Mushroom Risotto. The Thai Curry is a spicy yellow coconut curry with vegetables and jasmine rice. It contains many vegetables including broccoli, cauliflower, green beans and peas. Fish sauce and Thai chilies plus a host of other spices add to the flavor for 380 calories per serving. 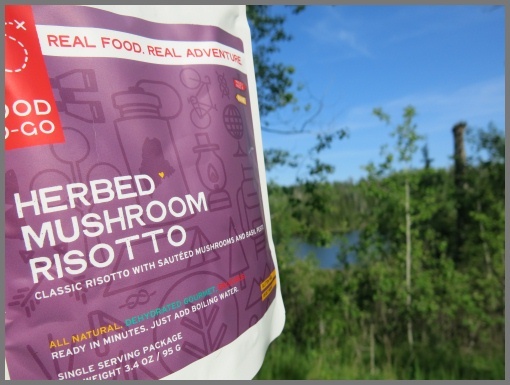 The Herbed Mushroom Risotto contains 410 calories and has mushrooms and basil pesto. 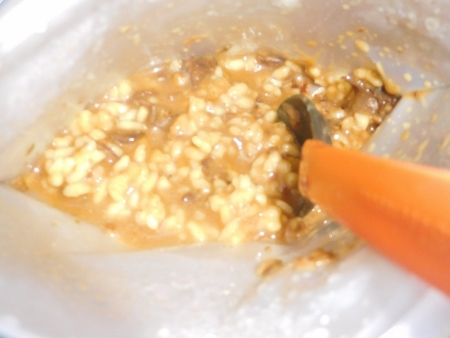 The rice was cooked in white wine for flavor and other spices were added. During the Pictured Rocks backpacking trip of two nights I took along one entree for each night. The first night I decided to try the Thai Curry. I was a little worried as I wasn't a big fan of "curry anything", but I have always had an open mind to taste. It was about 45 F (7 C) out when I prepared the meal on a beach at the lakeshore. I added the suggested amount of boiling water to the packet and waited the requisite 20 minutes. I took a spoonful of the curry to taste but there was still some crunch to it so I resealed the bag and waited another 5 minutes. Normally I repackage food to save pack weight before I go on a trip but did not for the test. Now about the taste, my first reaction to the curry was that it was going to be hard to finish the bag due to the spicy nature. I am not a fan of anything spicy but I was willing to sacrifice my preferences. And I must say that if a person really likes spicy food they might not even consider it that spicy. As I continued to eat, the flavor outweighed the spice and I am delighted to say that I enjoyed the entire package! That was a total surprise for me and I would definitely try it again. The next night I made the Chili. Again the temps were cool (55 F/13 C) but the entree stayed hot while they hydrated for the initial amount of time. After 20 minutes the corn was still not anywhere near hydrated so I added a bit more boiling water and waiting another 5 minutes. I was hungry so I went ahead and ate the entree but the corn in the chili still was rather crunchy. Now about the taste. Again I am not much for spices but the chili was not spicy. In fact it was very generic and reminded me more of corn salsa than chili. Something was definitely missing for me ...maybe more tomatoes and other spices besides the chili powder and cumin. I couldn't get quite through the dinner but ate about three-quarters of it. I have one more package of it so it will be interesting to see if I have a different opinion on my next trip. During my next backpacking trip which was to Isle Royale National Park, I took the last three entrees. I was very hungry due to the nature of hiking on rugged trails throughout a nine-day trip. Before I left for the trip I debated about reducing the packaging as I did have nine days of food with me. I decided to rough it out and carry them in the provided packaging for the purposes of this test. More about that later. On the third night of the trip I made the Herbed Mushroom Risotto. The temps were very pleasant at 65 F (19 C) so I had little concern that the food would not stay hot or be re-hydrated adequately. I added the required amount of water and thought about "how big the universe is". I also placed the sealed package inside my stove bag for a little extra warmth. Upon opening I tasted the risotto and it was very crunchy. I waited another 10 minutes and it was still somewhat crunchy but worse yet it was only lukewarm. At that point because I really wanted a hot meal I took the whole sealed package and placed it in a pot of very hot water (not on stove). After about 10 minutes I was able to enjoy the hot food. Not sure if the packaging was safe to place in hot water but I was hungry enough to experiment. The risotto wasn't as creamy as I would have liked, much more like eating a pilaf. Even though it was not quite like I expected but it was satisfying enough. On the fifth night of the trip the temps were similar. I looked forward to the Classic Marinara with Penne. I do consume brown rice pasta at home occasionally so I know it has a different texture than other types of pasta. After 20 minutes of re-hydrating it wasn't done. This time I decided to go directly to placing the package in hot water (boiling water that had been taken off the stove). After about 15 minutes it was suitable to eat. I did enjoy the taste as it is reminiscent of something I would make at home. On the sixth night of the trip I again made the chili entree. I had the same results as noted above, not my favorite. Overall, this whole test series surprised me. The entree that I mostly wasn't looking forward to (due to its spicy nature) ended up being the one I loved the most. The second favorite was the Classic Marinara with Penne. I would definitely eat those again but I could do without the others. I know food testing is very subjective but it is interesting to note that some of my expectations conflicted with what I ended up liking. I must say that the serving size ended up being very beneficial to me. I didn't need to supplement any of my meals with other food from my pack as I felt satisfied. I also enjoyed the fact that the meals resembled food that I would cook at home rather than something very mushy. I could actually pick out the vegetables such as cauliflower in one of the entrees. On a serious note, I do think that the re-hydration times are way off for the products. I actually think a boil-in-bag would work better for food that is only dried and not freeze-dried. Or the other possibility is that the food wasn't cooked enough before it was dried. Something to consider. Since the air temperatures weren't super cold during preparation I surely hoped for faster prep time. I have a great deal of patience but many others don't especially when they are hungry!! 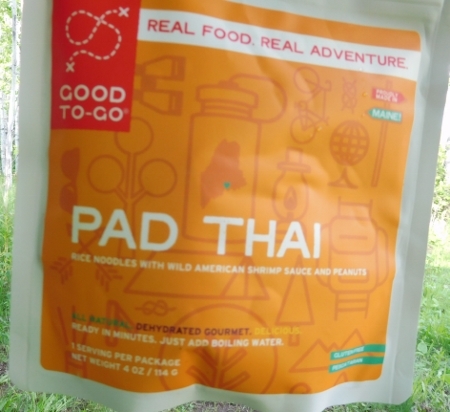 Thanks to Good To-Go and BackpackGearTest for this opportunity to test the food entrees. This concludes my Long Term report and the test series. Recently I had another opportunity to test two more Good To-Go Meals. I took the two meals on a trip to Isle Royale National Park which is an island in the middle of the world's largest freshwater lake. 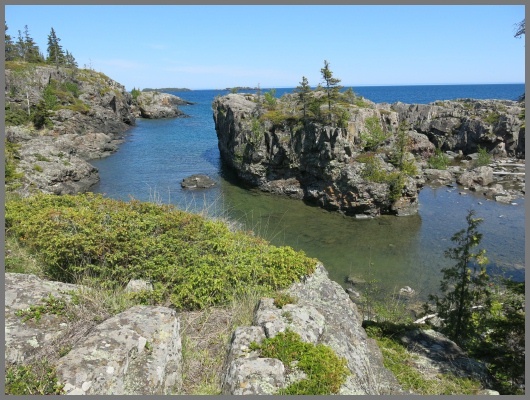 The weather was cool as norm along the shores of Lake Superior (at meal time the temp was approx between 55-60 F/13-16 C). This is always an important consideration when hydrating food. I brought the meals in their original packaging to insure some insulation (rather than dumping them into freezer Ziplocs that I like to do on longer trips). Once the bags were sealed I put them in an ordinary stuff sack to increase the thermal capacity. The first meal that I tried was Pad Thai. The meal was extraordinary although it didn't taste like any version of Pad Thai that I had consumed before. That could be because I have only tasted it in the United States so local versions could well be Americanized! The rice noodles are mixed with a delicious shrimp sauce made with Tamarind and peanuts. Lime juice and lime oil are noticeable but not overpowering. The matchstick carrots add a light crunch to the dish even after hydrating. I appreciate that, as I do not like to eat food while backpacking that is merely mushy. The Pad Thai also includes bean sprouts and caramelized onions in the ingredients. I was very pleased with the texture of the food after hydrating the recommended 15 minutes. The meal has a slight bite to the taste buds but not anywhere near hot, even with the Thai chiles. The single-serving meal that I enjoyed has a whopping 460 calories which satisfied my hunger. There is about 12 g of fat and 17 g of protein. The second meal I enjoyed is one that I had before - Herbed Mushroom Risotto. However this time around it was much more satisfactory as I believe some changes have been made. It is much creamier than last time. The risotto is made with sauteed cremini mushrooms, basil pesto, nutritional yeast, walnuts and white wine amongst other flavorings. It also has a hearty amount of calories at 410. The risotto takes a little longer to rehydrate at the recommended 20 minutes but it is worth waiting for. Indeed, I would gladly purchase these meals for future trips. The fact that they taste more like something I would make at home rather than many mushy backpacking meals, makes it more appealing and interesting as well as the fact that there is a sizable amount of good calories in one serving! The only downside for me is that I have to either order the meals online or drive to my nearest retailer (that stocks them) which is 145 mi (233 km) from here. However this is not an uncommon way for me to purchase things that I like, as I choose to live in a more remote area of the country. Thank goodness for internet sales!